Scott Monteith aka Deadbeat is back on Echocord with an absolutely killer EP. 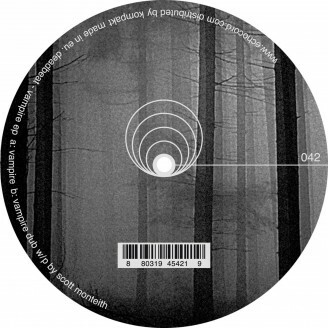 After his split ep with Fenin on Echocord Colour this year, and his earlier ep with Pole (D.P.) he is now back on Echocord with his Vampire EP. Deadbeat is one Scott Monteith, a long time Montrealer and recent Berlin ex-pat who has been releasing his own special blend of dub laden, minimal electronics since 2000, for labels such as Cynosure, Musique Risquée, Scape, and Spectral to name but a few. His work has been met with consistent critical acclaim from the industry's leading publications and websites, and drawn regular performance invitations for some of the world's most respected festivals, including Barcelona's Sonar, Berlin's Transmediale, and Montreal's own MUTEK. From 1999 to late 2003, Scott worked, assuming various roles, for the Montreal based company Applied Acoustics Systems, makers of a range of critically acclaimed software synthesizers. Having now moved on to pursue his own musical efforts full time, the experience has left him with a passion for the development of new creative interfaces, and a strong grasp of some the most cutting edge technology in the industry. A certified music technology junkie, his knowledge in such matters has been occasionally called upon at various events, most notably the 2007 edition of the Red Bull Music Academy in Melbourne, Australia.